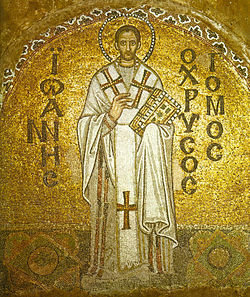 John Chrysostom (Greek: Ἰωάννης ὁ Χρυσόστομος), c. 349 – 407, Airchbishop o Constantinople, wis an important Early Kirk Faither. He is kent for his preachin an public speakin, his denunciation o abuse o authority bi baith ecclesiastical an poleetical leaders, the Divine Liturgy of St. John Chrysostom, an his ascetic sensibilities. The epithet Χρυσόστομος (Chrysostomos, anglicised as Chrysostom) means "gowden-moothed" in Greek an denotes his celebratit eloquence. ↑ The exact date o John's birth is in quaisten, an dates atween 344 an 349 are gien. In the maist recent general biografie o Chrysostom, eminent patristics scholar JND Kelly, efter a review o the evidence an leeteratur, favours 349 as the date that best fits aw available evidence, in agreement wi Robert Carter. See Kelly, Golden Mouth: The Story of John Chrysostom: Ascetic, Preacher, Bishop, (Grand Rapids: Baker Academic 1998: oreeginally published Ithaca: Cornell University Press, 1995), p. 4 fn. 12; esp. Appendix B passim. For a discussion o alternatives presentit in the leeteratur, see Robert Carter, "The Chronology of St. John Chrysostom's Early Life", in Traditio 18:357–64 (1962); Jean Dumortier, "La valeur historique du dialogue de Palladius et la chronologie de saint Jean Chrysostome", in Mélanges de science religieuse, 8:51–56 (1951). Carter dates his birth tae the year 349. See an aa Robert Louis Wilken, John Chrysostom and the Jews: Rhetoric and Reality in the Late Fourth Century, (Berkeley: Varsity o Californie Press: 1983), p. 5. ↑ 2.0 2.1 "St John Chrysostom" profile, Catholic Encyclopedia (see here); retrieved 20 March 2007.